The biggest surprise in these Chocolate Surprise Brownies lies in the combination of unusual ingredients that goes into making them. 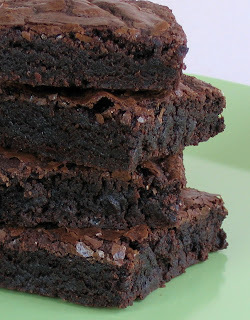 In addition to the usual suspects, such as cocoa and vegan chocolate chips, these chocolatey treats also include black beans, coffee, and bananas, resulting in rich brownies that not only taste great, they’re also economical, easy to make, and are lower in fat and sugar than many of their counterparts. 1. Preheat the oven to 350 degrees F. Grease an 8-inch baking pan and set aside. 2. In a blender or food processor, combine the black beans, sugar, and oil, and blend until smooth. Add the cocoa, banana, coffee, and vanilla, and blend until smooth. 3. Scrape the mixture into a mixing bowl. Add the flour, baking powder, and salt and mix until smooth. Stir in the chocolate chips and walnut pieces, if using. 4. Scrape the batter into the prepared pan. Bake for 25 to 30 minutes or until a toothpick comes out clean. Let cool in the pan completely, then refrigerate for several hours before cutting into squares. More tester photos to come soon, but next time I'll post that brownie recipe you've been waiting for from Vegan on the Cheap. Coming up next: Pepperoni Pizza, anyone? (and more...tester photos by Lisa). Also, a “surprising” brownie recipe, all from from Vegan on the Cheap. 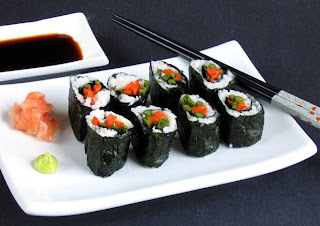 For Earth Day: Recycle Roasted Vegetables into…Sushi! In honor of Earth Day, I thought I’d share one of my favorite ways to “recycle.” It's by using leftover ingredients to make a new meal. The key to never wasting leftovers is to use them up quickly instead of letting them languish in the fridge. Many times, whatever you have on hand might inspire you to make something even better than it was originally. Take the sushi pictured above. I made it using leftover roasted asparagus and carrots as the filling. I never would have thought of using roasted vegetables as sushi fillings had I not had them on hand. I love the extra flavor the roasted veggies brought to the sushi rolls. It made a great lunch and there were no leftovers! Speaking of Earth Day, the food section in my local newspaper ran an article today that, to me, epitomizes what’s wrong with the “green movement.” The “green” tip was to pound meat thin to reduce the cooking time! What part of “animal agriculture is destroying the environment” do these people not understand? Veganism is the ultimate way to go green – we vegans put our environmentalism where our mouths are! 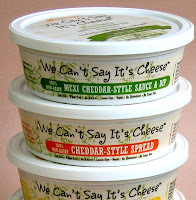 The nice folks at Wayfare Foods sent me samples of their vegan cheese spreads and dips called “We Can’t Say It’s Cheese.” In addition to their wonderfully rich flavors, the main thing that I like about these products is the ingredient list — it’s short, and it contains only recognizable, natural ingredients. 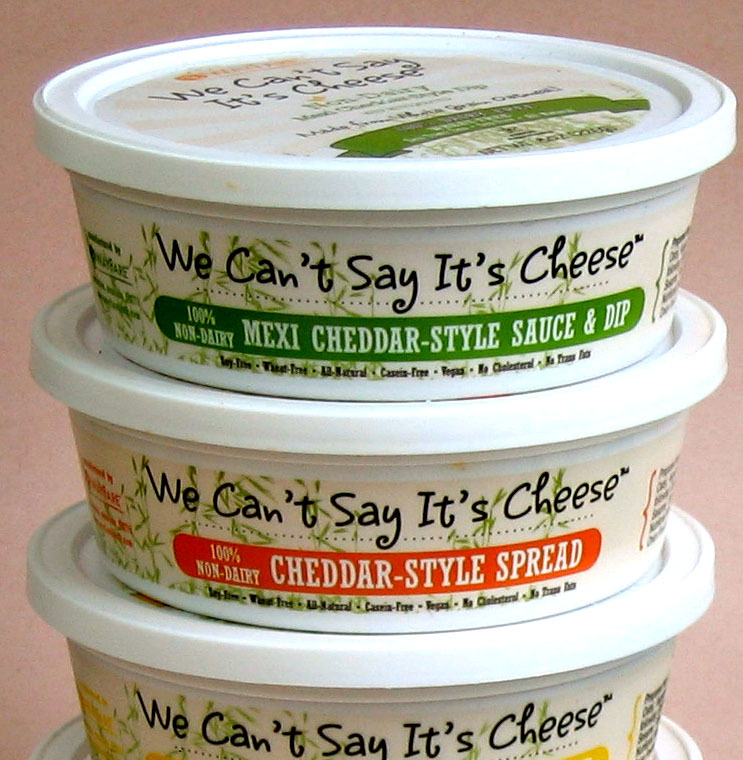 The biggest surprise was that the main ingredient in these yummy spreads is (believe it or not) oatmeal! 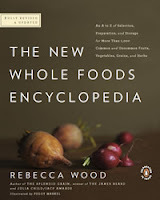 The publisher of The New Whole Foods Encyclopedia by Rebecca Wood was kind enough to send me a copy. I’m finding the book to be a tremendous resource for at-your-fingertips information on more than 1,000 vegetables, fruits, grains, nuts, and seeds, including the familiar and the not-so-familiar. This comprehensive book provides clear and carefully written descriptions of all these ingredients and how they can benefit us nutritionally. The entries also include information on home remedies, nutrition, and natural medicine. There are even a number of interesting recipes and informative sidebars. A great reference book, I’m actually reading it like a novel and enjoying the entries from acai to yuzu. I’ll close this post with a photograph of lilacs from my garden. 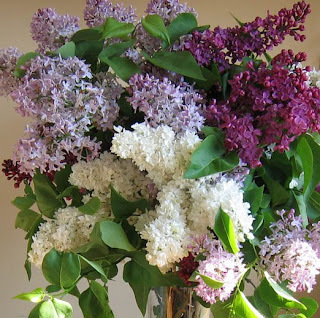 I picked some of each of the three different old-growth lilac bushes on our property. The dark purple ones are my favorite, but, interestingly, the white ones seem to have the most fragrance. Does anyone know why this is? Vegan on the Cheap has Arrived! My new cookbook, Vegan on the Cheap, is hot off the presses. I just paged through my first copy today and I’m very excited that it's now a reality. I especially enjoyed writing this book because I felt it was important to show that eating vegan doesn’t have to be expensive. I come from a family of frugal cooks, so I guess it’s part of my DNA to find ways to be thrifty with the food budget. 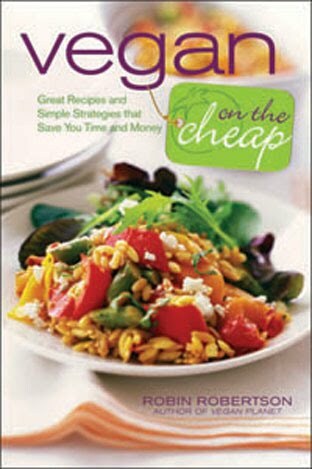 In Vegan on the Cheap, I share all the different ways I save money, while still cooking great vegan meals. 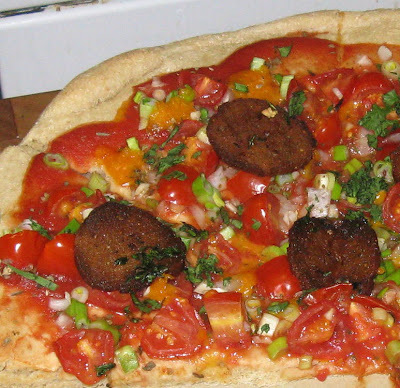 In addition to loads of money-saving tips, Vegan on the Cheap is filled with economical recipes including basics such as a Baked Seitan Loaf and Cutlets on the Cheap, as well as recipes for vegan sausage and pepperoni. There are lots of grain and pasta recipes, skillet dishes, sandwiches, and casseroles that taste anything but frugal, yet each recipe can be made for less than $2 per serving (some less than 50 cents per serving). 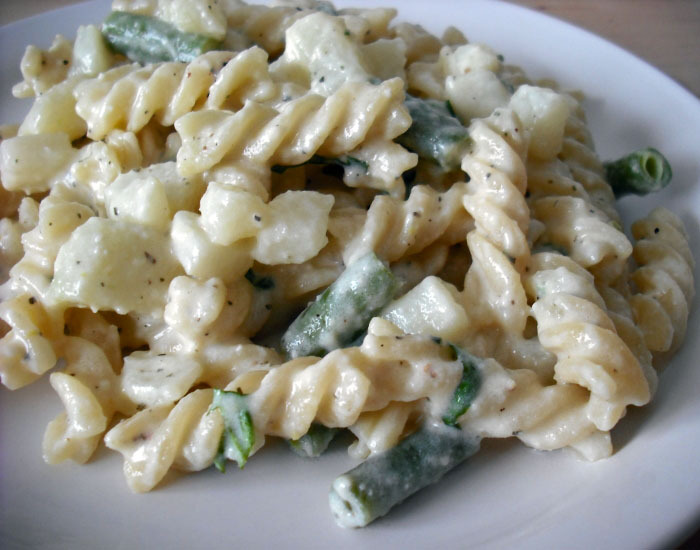 Salads include a yummy Garden Rotini and White Bean Salad with Inner Goddess Dressing (the dressing tastes as good as that expensive store brand) and Orange-Chipotle Dressed Salad with Black Bean Salsa. 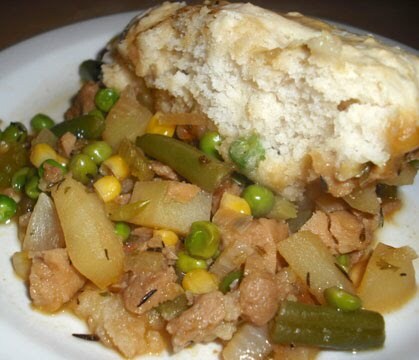 There's a chapter of slow-cooker recipes that include Tempeh Pot au Feu, Slow-Cooker Seitan Pot Roast, and one of my favorites: Smoky Red Bean Chili with Chipotle-Cornbread Dumplings. The dessert chapter is filled with delicious yet budget-conscious treats such as Italian Polenta Cake and Chocolate Blueberry Crumble. I’ll soon be posting some sample recipes from Vegan on the Cheap. In the meantime, it’s already available and in stock on Amazon and (where they are currently offering it at an additional 5% off the already discounted price, if you buy it along with 1,000 Vegan Recipes). The book can also be ordered on Barnes and Noble.com and Borders.com or wherever books are sold. If you like cooking great vegan food and want to save money on your food bill, then I think you’ll like Vegan on the Cheap. 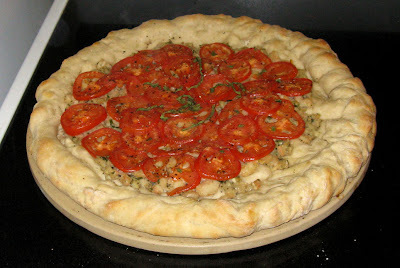 While the flavor is similar to my traditional “pie” version, the texture is much firmer (owing to the ratio of tofu to “sausage”) making it a dream to slice. 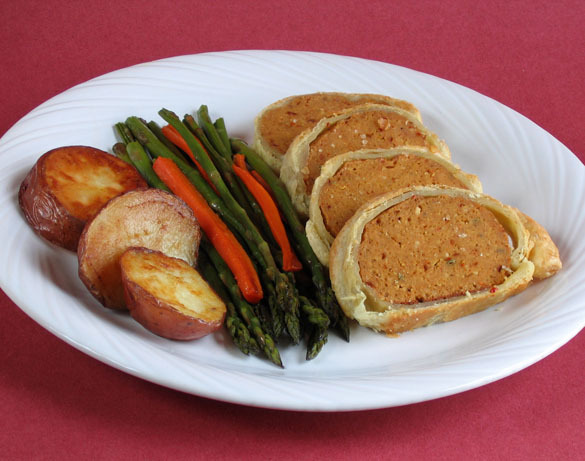 My family always ate a slice of Easter Pie cold for breakfast, but this new version also makes a lovely main dish served with roasted asparagus, carrots, and small red potatoes. Any way you slice it, this is definitely not my mother’s Easter Pie — it’s way better. 1. Preheat the oven to 350 degrees F. Lightly oil a shallow baking pan and set aside. 2. In a food processor, combine the wheat gluten flour, tapioca flour, paprika, onion powder, garlic powder, red pepper flakes, whole and ground fennel seeds, cayenne, salt, and pepper. Pulse to mix. 3. Add the tofu, water, soy sauce, olive oil, and ketchup and process until well mixed. 4. 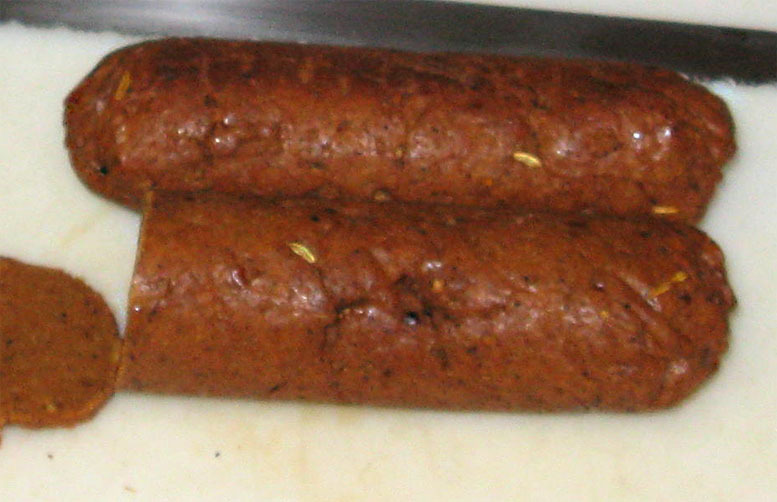 Shape the mixture into a 7-inch log, wrap it in foil and place it in a baking pan. Bake for 45 minutes, turning once about halfway through. Remove from the oven and set aside to cool completely. 5. Roll out the pastry sheet on a floured surface. Place the cooled sausage log on the lower third of the pastry and fold in the sides. 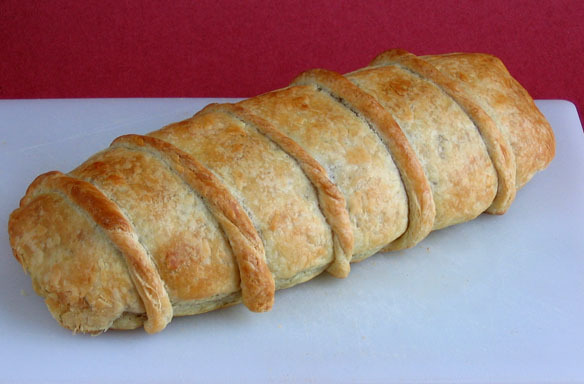 Roll up the pastry to enclose the sausage and use your fingers to seal the ends. Place the roll on a baking sheet, seam-side down, and refrigerate for 30 minutes. Preheat the oven to 400 degrees F.
6. Bake until the pastry is nicely browned, 25 to 30 minutes. Cool for 15 minutes before slicing with a serrated knife.